NPIV provides a means to assign multiple port IDs to a single N Port. This feature allows multiple applications on the N Port to use different identifiers and allows access control, zoning, and port security to be implemented at the application level. You must globally enable NPIV for all VSANs on the MDS switch to allow the NPIV-enabled applications to use multiple N Port Identifiers. The MDS discovered in the Vblock does not have NPIV enabled. This is required as per the checklist in the UIM Deployment Prerequisites document. 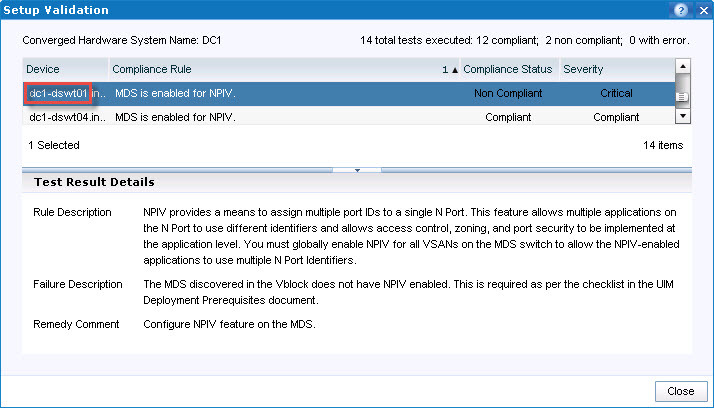 Configure NPIV feature on the MDS. This is a weird message considering the switch in question is Ethernet switch, not SAN switch and NPIV validation is not applicable. I have sent the database backup to UIM development team for analysis. Let’s wait what they come up with. Open UIM Configuration Cnter: Login to UIM management interface, click on the icon next to Logoff/Exit icon in the top right corner of the screen and launch Configuration Center. Why Ethernet switch gets validated with the MDS validation test? Is this another EMC UIM/P 4.1 bug? This is applicable considering unified switching in Vblock (Nexus 55XX – LAN & SAN in a box). In this, though you use 5K and UIM/P discovers SAN part the switch as MDS only. The question remain the same – why 5k gets discovered as unified switch?